I like the random bird on this background. 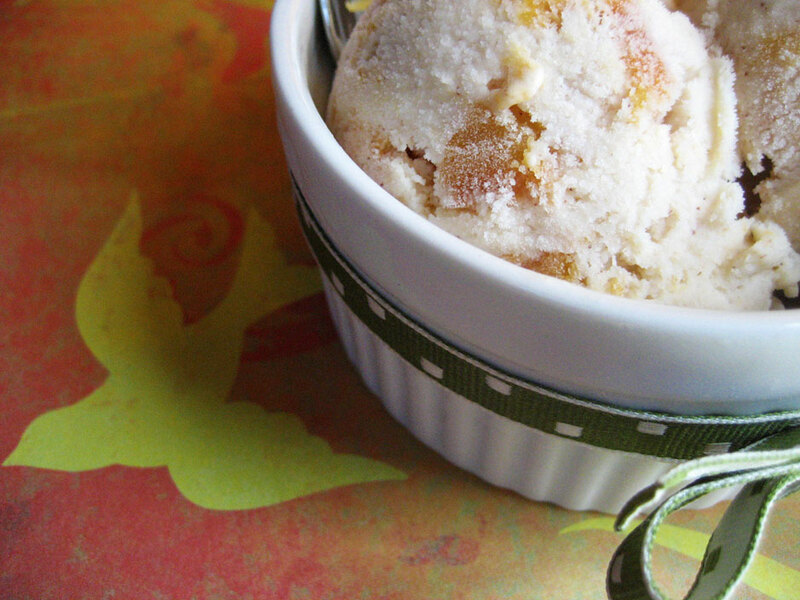 Peaches (along with most other summerish fruits) are especially delightful right now, and I wanted to make an ice cream that would do them justice. Luckily, I had anticipated this need for cold, peachy goodness way back in early spring, and had an entry in my idea notebook that I was very excited to make real. It involved fragrant, juicy peaches, caramelized with honey. It also involved LOTS of cinnamon. And, just to make it stand out above all other peach ice creams, it had the word “mascarpone” in it. The peaches could've been cut a little smaller but I love the way they look in there. It tastes like peach pie and summertime. It would be perfect with shortbread – perhaps in an ice cream sandwich? 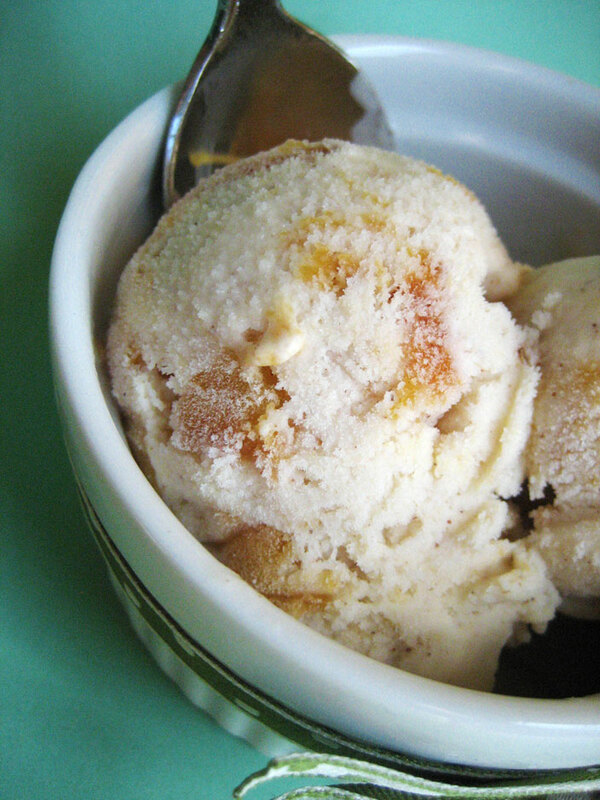 This ice cream is absolutely delicious and a great summer dessert. The peaches didn’t get as caramelized as I really intended, but if you have a torch or a grill you should totally caramelize some that way. You could also made a cinnamon-sugar swirl instead of using the loose ground cinnamon. Or a caramel swirl. Can you put cinnamon in caramel? If you can, you should. I mean, if you add caramel. I only made half this recipe, because mascarpone is expensive. I also made it by hand since it was such a small batch and I needed the ice cream maker for another recipe that day. A bow and some pink makes everything prettier! Preheat the oven to 500. 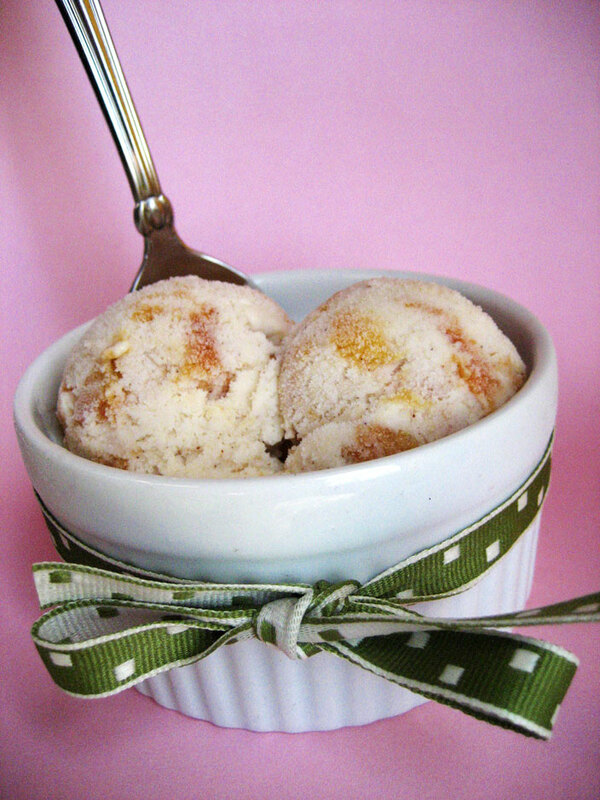 If you are not using an ice cream maker, pre-freeze a mixing bowl for the ice cream. In a stand mixer fitted with the whisk attachment, beat the mascarpone, milk and sugar on medium until smooth and thick with no discernible lumps of cheese. Refrigerate. Drizzle with 1-2 Tbsp honey and cook under the broiler for 5-10 minutes or so, until the peaches are juicy and slightly caramelized. Remove from oven and allow to cool for at least 10 minutes. You can then slip the peach chunks out of the skin. Place the peachy bits in a bowl and drizzle with any honey-peach syrup left in the baking dish, plus a little extra honey. Sprinkle with cinnamon to taste and toss to coat evenly. Place in refrigerator to chill. Once the mascarpone mixture and peaches are both nice and cold, churn the mascarpone mixture plus the alcohol in your ice cream maker, adding the peaches at the very end of churning before removing to a freezing receptacle. If you don’t have an ice cream maker, you can, of course, just follow my directions for making ice cream without a machine. Hooray! I knew from the title that I’d love the sound of this ice cream. 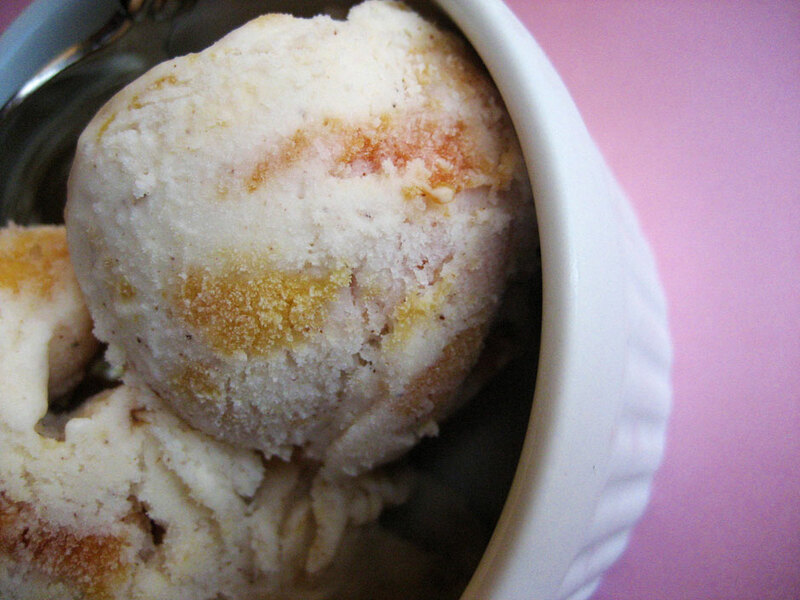 Even though it’s currently freezing here and peaches aren’t in season, I’m still dying for a scoop of this! Looks and sounds just perfect! Lovely! 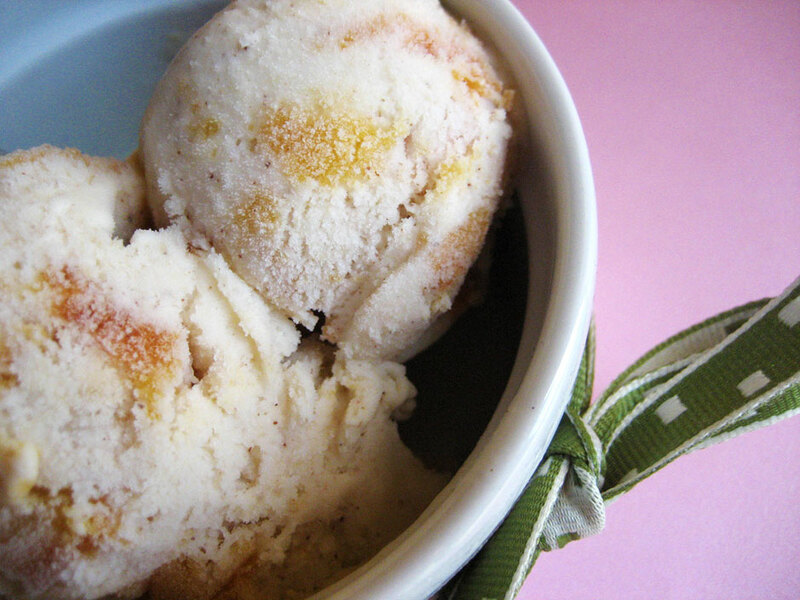 Mascarpone and cinnamon and peach, oh my! I love peaches and this is great ! cz i have plenty that are bruised and I cant make peach crumble everyday! so this is new! thanks! 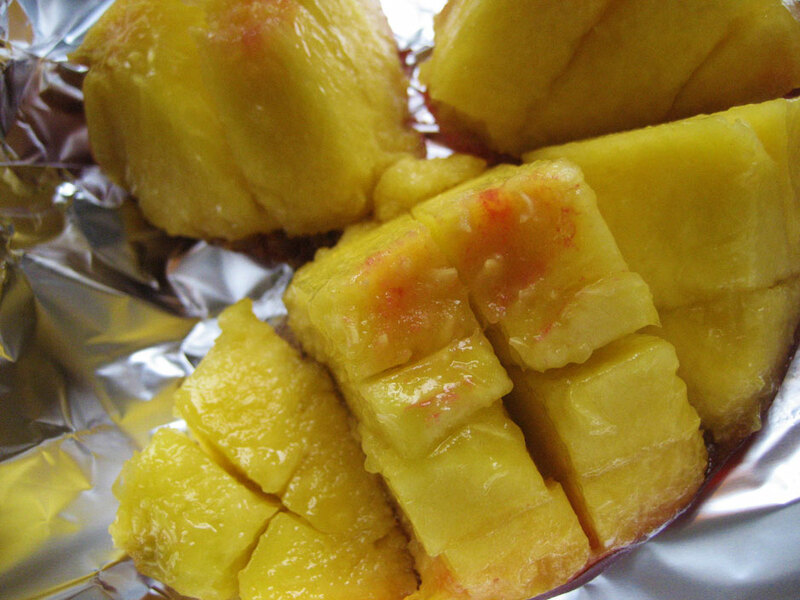 Can you try mangoes next time? I definitely plan to do something with mangoes at some point in the future. I’m pretty sure the grocery store below my new apartment has mangoes aplenty so hopefully they are cheap and I can do some mango-y treats. This is outstanding in so many ways, not the least of which is that it’s made by hand!! Your ice cream sandwich idea sounds magnificent – a new twist on a peach pie. Thanks so joining the ice cream social! Exactly what I was looking for! Will let you know how it goes. I’ve just made this but without fruit ( daughter can’t eat most fruits) so I used about a tablespoon of pure vanilla extract about the same amount of Maple Syrup and the cinnamon. I’ve just finished churning it and first taste is delicious.